This is my mother-in-laws recipe. I love it! She makes it for family gatherings like Thanksgiving and Christmas. 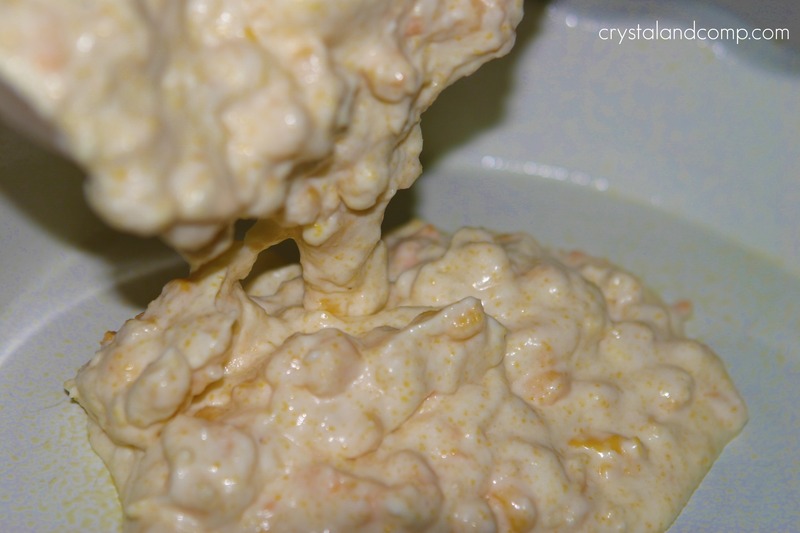 Even better, it is easy and uses simple ingredients. Dump the box of muffin mix in a mixing bowl. Open your cans of corn. One cream-style and one regular. This is key. 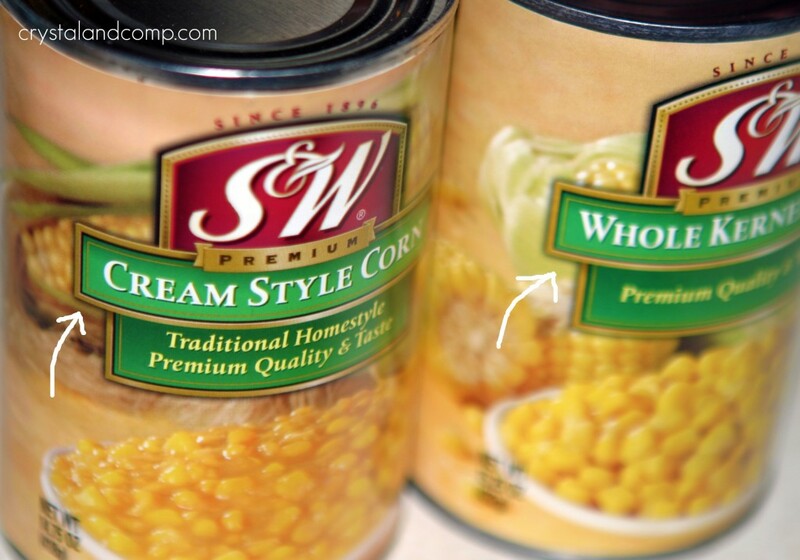 Dump the cans of corn and all remaining ingredients into the mixing bowl. Stir well to combine. I like to use a whisk. 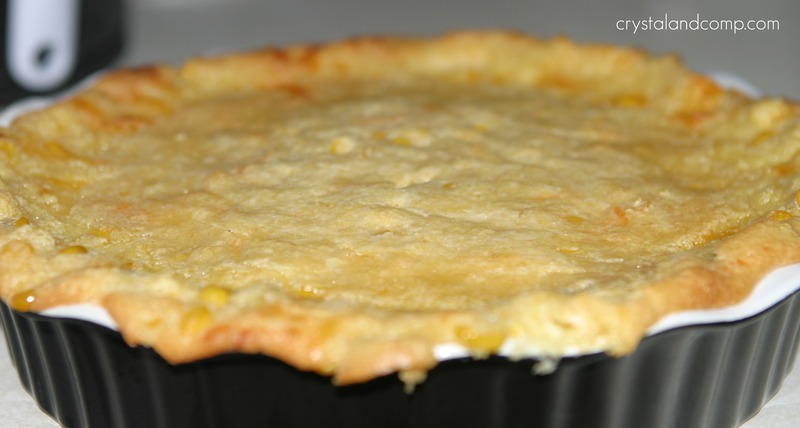 Spray the bottom of a pie plate or an 8×8 baking dish with non-stick cooking spray. Pour the corn casserole batter into the dish. Pop it in a 350 degree oven and bake for 40-45 minutes, or until the top is golden brown. When you remove it from the oven, let it set for about 10 minutes or so, letting it cool and firm up a bit. When you scoop it onto plates, it is not going to cut into pie slices. This is more of a gooey’ish casserole. In other words, perfect. Open your cans of corn. One cream-style and one regular. This is key. Spray the bottom of a pie plate or an 8x8 baking dish with non-stick cooking stray. Yum! Warm things in the oven are perfect for Winter! This looks yummy! I’m going to try it and add jalapenos, we like it hot! Thanks for sharing! Debby, I bet jalapenos would make is very tasty! Let me know how it turns out if you try it. 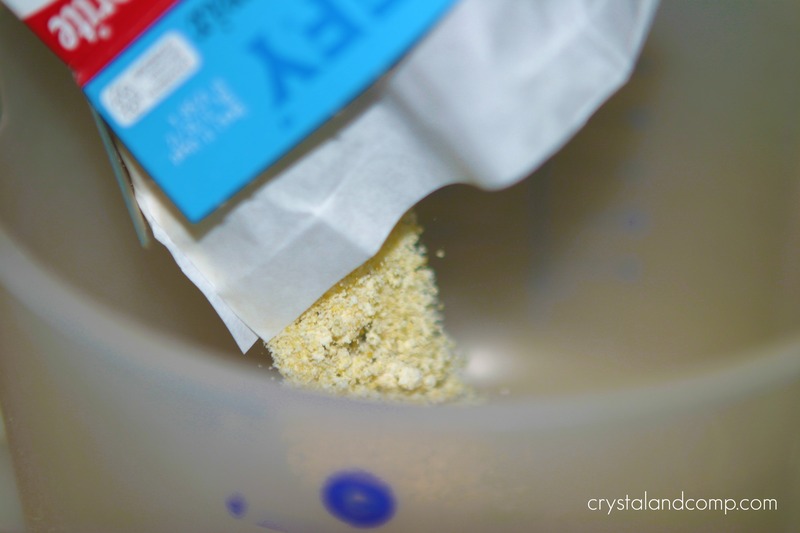 This is in the oven right now… can’t wait to see how it turns out! It was a hit! I have 3 boys and a girl – plus my hubs… they gobbled it up! This is a popular dish where i live. Its not a holiday without it! Families around here have been making this for years. I like its versatility. I sometimes use a can of Mexicorn in place of the regular corn, and you can add some green chilis as well. You can brown a pound of ground beef and make as you would for tacos, put it in the bottom of a casserole dish, add the corn casserole on top(with extra cheese) and bake for a full meal! This is one of my favorite recipes to make! My whole family loves it and sometimes I even add some cheese to it. Havarti and Fontina is really good with it! I am a new follower! Stop by anytime! I have this same recipe on my site! Except mine doesn’t use cheese, but I will DEFINITELY be adding it next time to try it out. Who doesn’t love cheese?! I copied your recipe and it looks amazing! Thanks for pinning Mary! Enjoy. My neighbor brings this every year to Thanksgiving, and we eat it like we’ve never eaten anything in our lives, it’s so good! Thank you for the recipe–I’ll compare it with hers, but I’ll bet they are the same. Thanks to linking this to Food on Fridays! 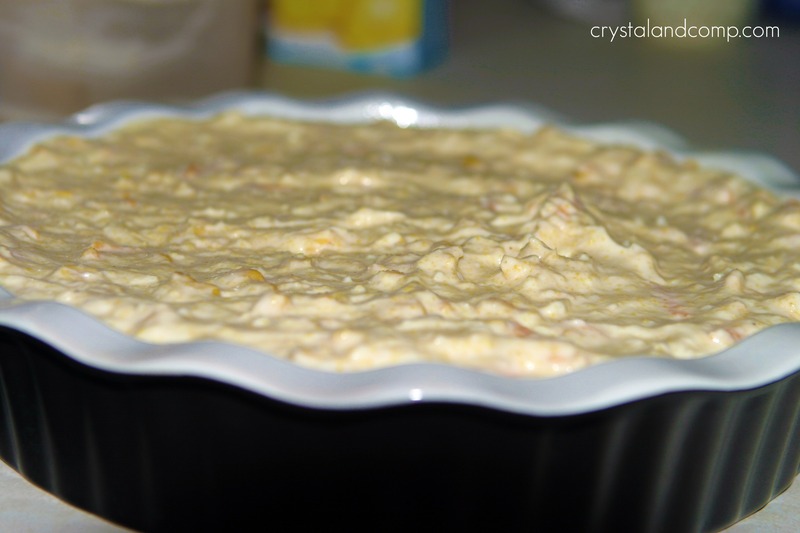 Crystal, this looks like an awesome Corn Casserole, so creamy and delicious. Hope you are having a great week end and thank you so much for sharing with Full Plate Thursday. Shannon- it is so yummy. You’ll love it! This looks great! I am now following from Tasty Tuesdays–have a great week! Thanks, Angela! So happy to have you! Awe, thanks Linda. It is super yummy! Ha! That’s awesome. It certainly is a crowd pleaser! This looks awesome. Definitely need to make it soon! 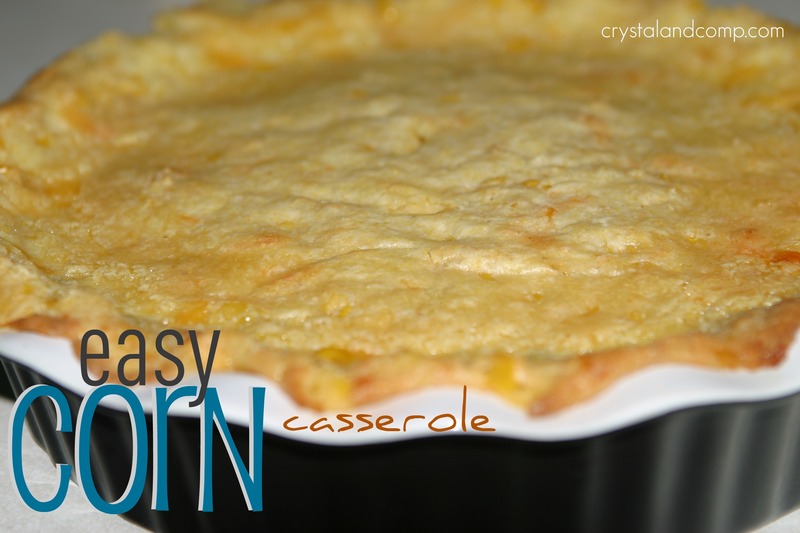 This is a great Corn Casserole for the upcoming holidays and great for a covered dish. Hope you are having a great weekend and thank you so much for sharing with Full Plate Thursday. Yum, this sounds good too…..easy enough too and like one reviewer said, add some sautéed ground beef to it, and you have a meal…..and the jalapeños sound good too. 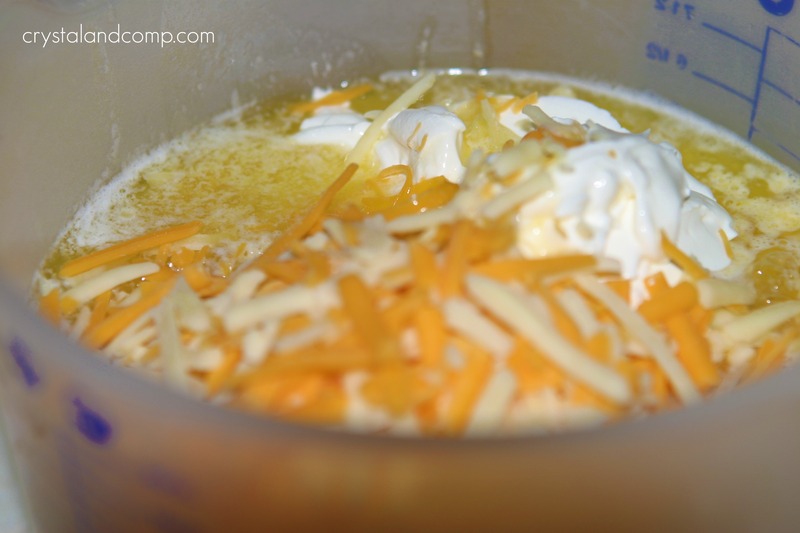 thanks for posting your mother-in-law’s recipe…..can’t wait to try it…..